Expect delightfully varied and unique experiences during a Portland vacation. Against a scenic hillside backdrop lies a jumble of sophisticated restaurants, colorful gardens and galleries, and lively brewpubs. Book a Portland hotel and discover its intoxicating treasures. From shabby chic boutiques to big brand stores, Portland is a popular destination for shopping, with zero sales tax and an exciting array of shops. There are plenty of modern malls and upmarket shopping streets where you'll find your favorite designers, but the real gems of Portland are found down side streets where hipsters shop for unique vintage finds, and have a keen eye for up and coming trends. It may be a mecca of hipster and urban cool, but Portland also has an enviable position close to the natural beauty of the Oregon countryside, and is surrounded by areas of national forest land. The city is split in two by the Willamette River, with downtown parks, museums, and art galleries that show off the city's cultural side, and plenty of outdoor attractions where you can appreciate the changing seasons. From a pizza and a pint of local porter to elegant seafood dinners on the riverfront, Portland’s culinary enticements are many. Book a Portland hotel and taste the myriad flavors with this guide to the top 10 food and drink things to do in Portland. Summer vacations in Portland come alive with sunny days, ideal for visits to art galleries, leisurely tasting tours through wine country and alfresco dining with a sunset backdrop. Book a summer hotel in Portland and uncover the city’s unique delights. 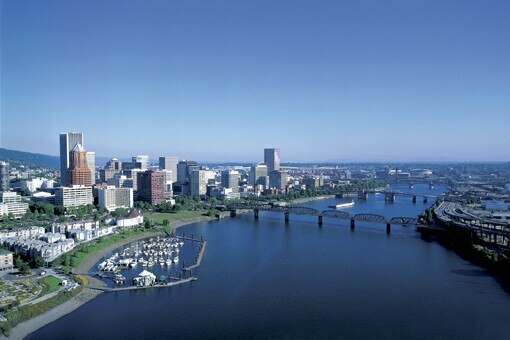 Take a short getaway in Portland and experience the best of this exciting city. Book a Portland hotel and let this two-day itinerary serve as your personal city showcase. Whether you want to stay in a Portland hotel in Downtown’s thriving cultural center or near the tree-lined enclave of Nob Hill, this guide will help you understand the city and choose where to stay in Portland. Set amid the lush forests of the Oregon countryside; Portland is an oasis of urban cool. The hipster population has brought cutting-edge culture to the city, from art shows to experimental theater, and there’s a wealth of museums and galleries to explore. The urban landscape is broken up by the Willamette River which runs through the city, as well as large parks where you can enjoy the changing seasons. The ultra-cool downtown area of Portland is full of hip distractions, from independent theaters to challenging contemporary art exhibitions. The city has been home to, and inspired, many authors and musicians, with its diverse architecture, outdoor spaces, and lively cultural scene.